Cosy cottage for two. Recent refurbishment combines tradition with a contemporary look. Detached, tranquil, private and on one level within 20 acres of fellside managed for conservation. Parking. Short breaks. In heart of Lake District, stunning views over Langdale Pikes and Elterwater Valley. Within easy reach of all facilities and attractions. Peaceful and private. Abundant wildlife walks from the door, private garden. Short breaks available. Ash Cottage offers weekly bookings starting on Saturday. The accommodation comprises one comfortable double bedroom with fitted carpets, shower and vanity unit. Sitting room with wall lighting, fitted carpet and dining facilities. Separate fully-equipped kitchen with tiled floor. Separate WC, small cloakroom entrance suitable for hanging outdoor things. unit 1 offers weekly bookings starting on Saturday. From Ambleside take the A593 towards Coniston. At Skelwith Bridge, travel over the bridge and continue up the hill for approximately 0.5 miles. The driveway is on the left sign says Stephen How no sign for Ash Cottage. 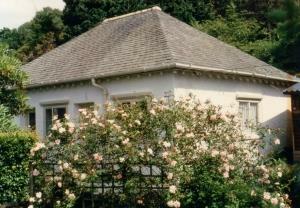 The cottage was homely, tastefully decorated and well equipped and set in a superb scenic location. A wonderfully tranquil spot surrounded by nature. A great place to unwind.